Here’s our fantasy premier league teams GW14 article where we give our early thoughts on the FFGeek team for GW14. We look back at gameweek 13, The monitor list, transfer thoughts plus early captain thinking. So gameweek rank wise my worst of the season comprehensively. 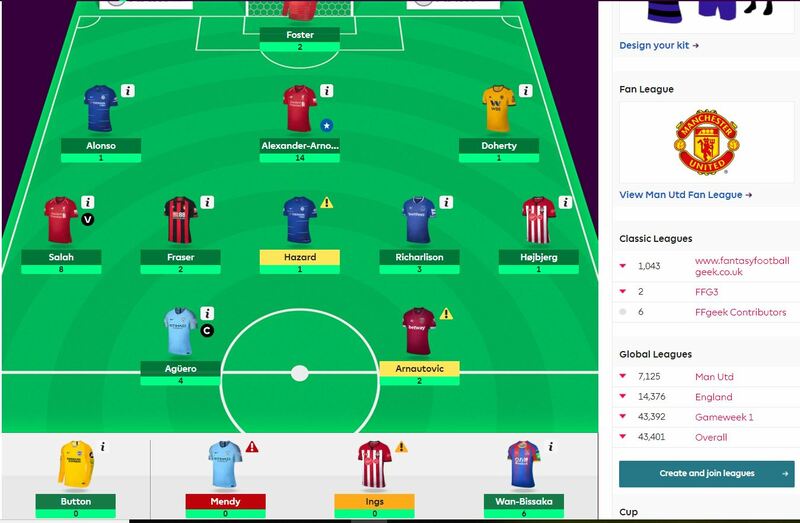 The first time with a gameweek rank of 4 million plus. Only 2 returning players in Alexander Arnold and Salah. Salah returning though due to the amount of times he was captained was actually rank damaging so you could say only 1 returning player. A red arrow that could have been alot worse in a 15k drop to 43k. The rank damage was done in part due to the wrong captain pick of Aguero. The Sane and Sterling hauls weren’t that rank affecting as they are still relatively lowly owned although that will rise obviously. The Ings injury was frustrating. Against Fulham is the time you don’t want an attacking player injured. Wan Bissaka clean sheet was also frustrating as I’d backed him ahead of Hojbjerg most weeks and it was only the fact that Southampton were playing Fulham that I put Hojbjerg head. These are named so as they form the basis of a large number of serious FPL managers teams. There is no definition of template although I define them as 70% of the top 10k or 7/10 top FPL managers I follow. The template players will not gain you much ground when they score as everyone has them but when they fail everyone fails so in theory you shouldn’t lose 2 much ground. These players add nothing and are there to warm the bench at minimum cost. Mine the motley crew of Foster, Fraser and Ings. Mendy will also go to Laporte this week and that will be my 4th differential as, surprisingly, the City defence is pretty lowly owned with Mendy injured. 3 of those 4 don’t bode well for future gameweeks. So what I mean by this is that you may have Martial instead of Richarlison or Sterling instead of Hazard. Each week your template replacement player will take on your template player in a high risk game of FPL chicken. It’s even higher risk if the battle is against a captain favourite. If you win that individual battle you will get a rank boost if you lose you will see a nasty drop in rank. Getting into these template battles doesn’t mean you will lose but you may suffer more rank volatility week to week. A great positive example this season has been the FFGeek contributor league leader Jordan Sadler who made a conscious decision to have Mane as a template replacement for Hazard and over the last 5 games Mane has scored 29 points vs Hazard’s 9. He’s also done well getting Martial as a differential early and now has an overall rank of 1,264. How do you gain rank in this set up? and thirdly your weekly transfer. This will be the case if you’re not picking a template player especially. The template players will help cushion the rank loss. Remember these are only my thoughts. 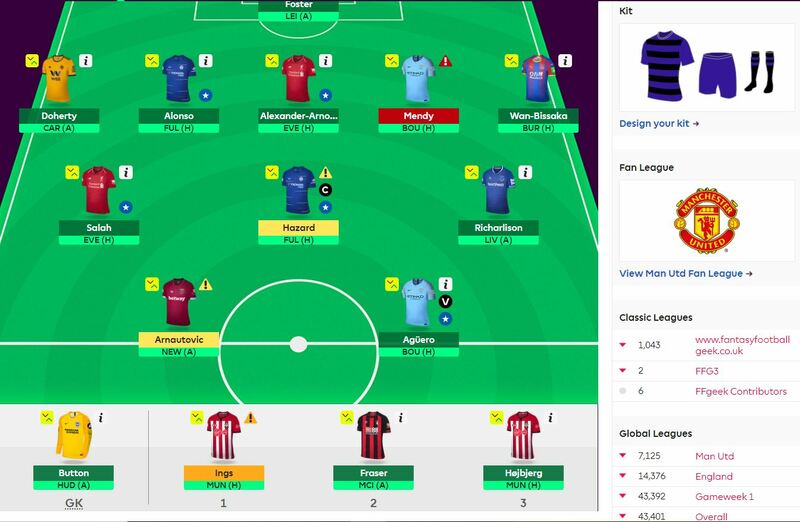 There are many different ways, reasons and objectives in playing FPL and no right and wrong. The Aguero failure at West Ham, the Sterling and Sane points, the Hazard 1 assist in the last 5 gameweeks, the Spurs and Arsenal good fixtures from 15 and 16 onwards. We now could be going to be headed into uncharted territory and it’s impossible to see how things are going to change but it’s hard to see how they won’t. The next 3 gameweek transfers will be important. It’s going to be very interesting to see the captain and transfer polls this week. So I’ve flagged Hazard as a future think for the GW16 game against Man City as a potential exit point. Hazard is a an injury doubt at the moment but would need something categorical from Sarri to even think about getting rid of him v Fulham. I haven’t flagged anything yet with Aguero or Salah. I’ve also flagged Richarlison for GW17 when Everton come up against Man City and Spurs after that. 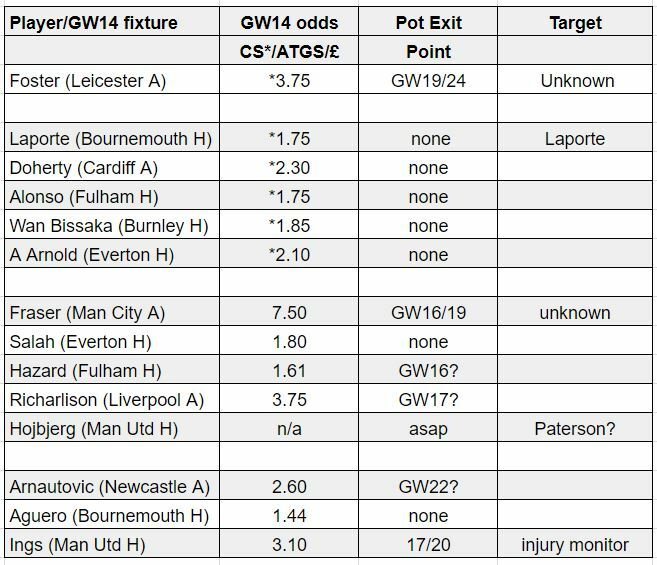 Arnautovic is also flagged but he has good fixtures until GW22 so if fit he stays until then. Another rank affecting captain choice this week with Hazard home to Fulham and Aguero home to Bournemouth. At the moment I just don’t know. The Hazard injury is a nuisance as the Friday kick off doesn’t give time for the poll to be put up after the press conferences on Friday. Needs some thought. Hopefully we’ll get word earlier. Not difficult this week. The only choice will be between Ings home to Man Utd if he’s fit or Richarlison at Liverpool. At the moment I’m putting Richarlison in the lineup. Assume Mendy is Laporte. 5 at the back and only 2 of my 4 differentials start. It’s hard to see how this will be a positive week unless I get the captain call right. 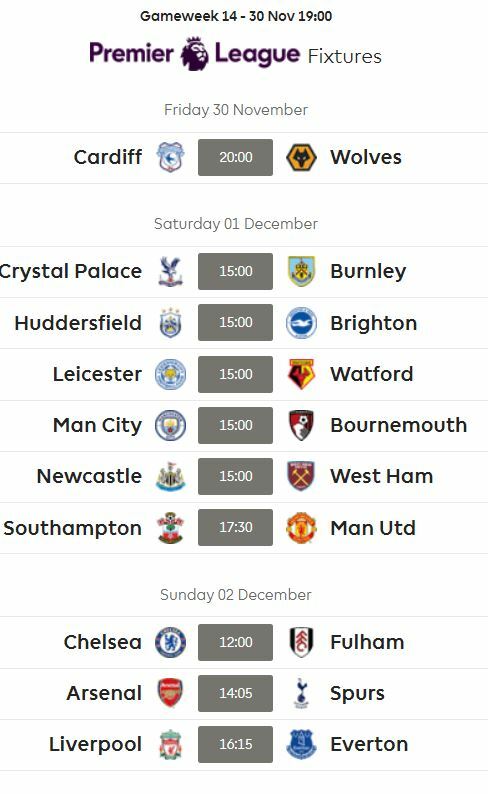 Gameweek 14 starts at 19.00 on the Friday 30th November UK time. Set your team up now in case you’re waylaid for some reason. Mitrovich saved my week from being an utter disaster. And I agree… that Hazard injury is very annoying. If he is injured I will be lining up with 5 at the back too. Bit of insight into Ming thingking. Great analysis. It’s not easy to go into such detail after one of your lowest scores of the season. But your audience needs you and you delivered. Great article as always. You could argue with Man City scoring four that you got the captain call spot on. Cant believe Aguero blanked with no assists either.. 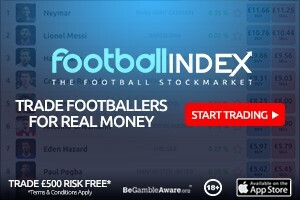 Hazard v Fulham is a must keep with his high ownership unless he is definitely ruled out. I had high hopes for Aguero and put him in as a triple captain. Essentially I feel like the season is over and it’s not even December! Think it’s always a big risk using your triple captain this early, should always wait until a double gameweek imo. But either way, it’s very early on in the season so plenty of time to boost your rank and catch up in your mini leagues! If it makes you feel any better last season in GW11 I was ranked 1.27m and by GW25 I was 64k. Just got to make smart decisions and get the right balance of template and differentials based on your rank. Hope this helps! Ming.. I am thinking the same thing. I just really want to dump Salah to free up the funds after GW 15… Arsenal and Spurs assets are so tempting and I just cant help feeling that they are the go to teams now. I am not sure I want to dump Alonso tho. Who would you bring in for him? Trippier?… Chelsea have good run coming up after City game. And all this upset over Hazard is unfounded… he will be banging them in soon enough. I think it’s a big risk dumping Salah. End of the day the guy has scored 8 and assisted 2 in his last 9 games in all comps and seems to be coming into good form now just like Mane and Firmino do. Once all three are in good form and firing like we know they can I think not owning Salah could be a very big rank hurter but that’s just my opinion! I debated, and debated and debated some more switching Hazard for Sterling for a one week punt (I wanted Hazard for that Fulham match next GW). Had a gut feeling about Sterling, and really didn’t think Hazard would score against Spurs. In the end didn’t to it as one week punts rarely work, and I have a view that transfers are as important as funds in FPL, and Id essentially be wasting two transfers with that move. I had my worst GW this season…ugh. Gary, I’m not convinced any Man Utd assets are worth investing in right now and I love the look of Anderson as a player. With West Hams fixtures looking so good I took a gamble on dumping Hazard and Hughes (annoying me since day 1!!) for Anderson and Sane. (I’m currently in top 20K) So My crystal balls are claret and blue…. Thanks Vegas Bhoy, nice to get some feedback from someone. Jordan I agree about Salah. However, I myself am only considering dumping from GW16 on for 5 or 6 GW’s to take advantage of Spurs and Arsenal’s fixtures when Liverpools are not so good. In the end I probably wont dump him tho. Geek. I really would love to read an article where you debate the notion of taking the odd transfer hit. I feel they are more useful than a strict ‘no hit’ policy. Getting in an in form banger with a cushy 5 week schedule must be worth the odd 4 point hit. Alas, I feel the pros and cons to both arguments. Is there a clear way to look into this? A minus 4 is obviously bad but if it was spread over an outlook of 5 weeks you are talking less than one point hit a week. Something that may need to be done come the big ‘Kane swap of week 16’.. I have a very similar team to you Geek, I brought in Laporte last week and the only otrher differences are I have Mane, Firmino and Barkley instead of Salah, Arnoutovic and Hojbjerg. With 55 points I was down at around 2m on the week but got a 22k green arrow to 125k so I think it was a bad week for most of the top 5%. Anyone close enough to Chelsea for ideas of whether Barkley is likely to start against Fulham don’t want to miss out if he does but don’t want him to get me 1 point for coming on for the last 5 min. Barkley needs to go soon I am most minded to replace him and Firmino for Kane and a 4.3 midfielder (any idea when Kevin McDonald will be fit? ), alternatively I could do a straight swap for Siggy but that would have to be before he goes up in price, that gives me plenty of flexibility to select based on match ups but might spread my cash too thin. The alternative is to hold back this week. Am myself holding back a transfer this week as there’s way too unpredictability in my view and there’s nothing too urgently flagged as Arnie is also fit again…but get a sense the template winds are gonna change now to a large extent especially if Spurs and Arsenal continue their ascent..